Bigvan makes London office removals smooth, efficient and cost-effective. Bigvan understands how time and cost critical business moves are. 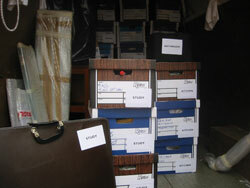 We’ll help you to plan and organize everything you need to make your relocation swift and painless. We’ll get your computers, copiers and filing cabinets in place, and get you up and running fast. We will visit your business to make a moving plan and prepare a quote for you, and we’ll help with advice on the most efficient preparations you can make for a move with the minimum down-time. We can provide packing materials and advice, we can pack for you, and we can and help you to schedule and prepare for your move. Our aim is to make your commercial move all go with the minimum fuss, and for your business to be up and running in the new location in the shortest possible time. Let the Bigvan take care of your office removals. London business moves have been a key part of our business since 1996. If you check out some of our testimonials, you’ll see just how often clients return to us.